Here you will find infrared thermometer for measuring temperature without contact. Our infrared thermometer make it possible to measure a temperature without contact by way of determining an object emitting infrared radiation. All non-contact instruments contain a targeting light to ensure the correct surface area is being measured. An infrared thermometer can only measure the temperature of exposed surfaces and not through glass. 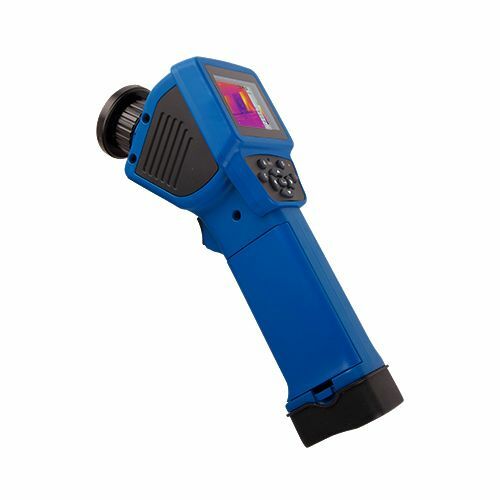 Some infrared thermometer posses a preset emissivity value, and others allow the user to choose the emissivity value depending on the surface material being measured, whether it's paper, wood or metallic surfaces. If the user measures shiny metallic surfaces, such as cylinders, the non-contact devices can only be used to determine tendencies in temperature as it's not possible to measure absolute temperature with infrared thermometer on polished or shiny surfaces. Please read: how to use an infrared thermometer. If you find yourself in the situation that you can't measure the surface temperature of a particular material, have a look at our contact thermometer. If you can't find the infrared thermometer you are looking for, please contact us and we will help you find the best solution to satisfy your needs by calling our offices on: UK customers +44(0) 23 809 870 30 / US customers (561) 320-9162 and our technical staff will advise you regarding our products. Our engineers and technicians will be happy to help you with the infrared thermometer, and of course, with the other products in the field of regulation and control, scales and balances. Infrared thermometer with adjustable emissivity can be used to measure the surface temperature of different materials. Here is a table of emissivity values for various materials. All thermometer are shipped pre-calibrated however an optional ISO calibration certificate is available which includes a laboratory calibration for all out thermometer excluding the PCE-880 infrared thermometer. to test temperature of cooling installation. temperature in a forging work. The laser, which is an additional component of the infrared thermometer, is used to indicate the place where temperature is being measured. There are temperature measuring handheld instruments provided with double laser beam that accurately show the measured point. However, the infrared sensor is responsible to capture the temperature. Measurement point increases in relation to the distance (as we can see in the upper image). Depending on the infrared thermometer lens the measuring point will be greater or smaller, it also will depend on the relation between distance and measuring point. For instance, a 50:1 lens indicates that within distance of 50 cm the measuring point will be 1cm, at 100 cm the point will be 2cm and so forth. Laser light in an infrared thermometer is intense. However, only certain lasers are powerful. Intensity is a power measurement per unit area, and even lasers that emit only a few Milliwatts can produce a high intensity beam of a millimeter in diameter. In fact, its intensity can be equal to sunlight. Any lamp emits more light than a small laser but this light is scattered throughout the room. Some lasers can continuously produce many thousands of watts, others are able to produce billions of watts in a pulse with a short duration. Laser light in infrared thermometer is coherent. It means that all light waves from a laser are neatly coupled together. An ordinary light, as the one from a bulb, generates light waves which start at different moments and move themselves in different directions. Something similar happens when a handful of small stones are thrown to a lake, then small splashes and some undulations are produced. But, if these little stones are thrown one by one at a regular frequency and at the same place, a greater wave can be generated. Laser works in this way, and this special characteristic may have diverse utilities. In other words, a bulb or a lamp are like guns, while a laser will be like a machine gun. 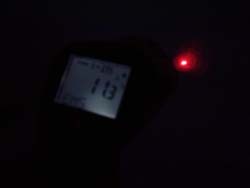 Infrared thermometer laser light is monochromatic (only one color). Common light has all colours contained in visible light (that is, the spectrum) when they are combined. Laser light has been produced in all colours of the rainbow (however, the most common is red), as well in many light visible types. A laser can only issue exclusively a colour. There are tunable lasers which can be adjusted to produce diverse colours, but even these ones cannot emit more than only one color. Certain lasers can emit several monochromatic frequencies at the same time, but not a continuous spectrum containing all colours of visible light. There are also several lasers which emit visible light like the infrared and the ultraviolet light. Why is laser light of an infrared thermometer so dangerous? Lasers are coherent and specific, that is, laser beams photons are unidirectional with the energy focused on a very small spot. This is similar to the way solar energy is focused by a lens. Lasers are parallel. Light are not dispersed in a laser like it is in a lantern . Never point the laser of the infrared thermometer to a person’s eyes. Do not directly look to the laser beam. Laser beams can be dangerous for humans’ eyes. Be aware of reflective surfaces, such as glasses, mirrors or polished metals. A reflected laser bean can also be dangerous to humans’ eyes. Use the laser in a controlled environment only. For instance, do not point the laser beam through a window. If you decide to let your laser to a friend, make sure they are fully aware about its dangers. Lasers can move to several kilometers. Wear protective glasses when working with lasers. If you meet these guidelines, you can enjoy and use high power lasers safely. Infrared thermometer cannot be used for playing, so they cannot be presented as a toy. It should be avoided to be shown with children’s product. Laser pointers, in any form of presentation (class 3 or higher) cannot be marketed or distributed free of charge, except for those created for specific professional use, so it should be clearly indicated in their labeling. It is not considered professional use those used to help in conferences. Laser pointers should have the necessary information at least in the official State language, clearly legible by the customers. The applications of use of infrared thermometer is quite extensive. They are frequently used in industrial processes, the professional sector and in particular to monitor mains supply units or to measure the temperature of components in motors or machines. 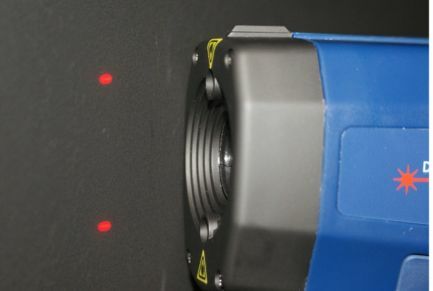 The photos below show laser meters being used to measure temperature. Another application for these infrared thermometer is in the detection of patients infected with SARS. Many states in Europe, Asia and North America are using infrared thermometer such as the the compact PCE-TC 3 infrared camera, as it's ideal for detecting temperature with great accuracy. Images of other applications for non-contact infrared thermometer can be seen here: Applications of use of infrared thermometer. If you wish to view or print a selection of infrared thermometer from our catalogue, click the PDF symbol. in Polish in Czech Republic in Bulgaria in Russian in Turkish and in Portuguese .